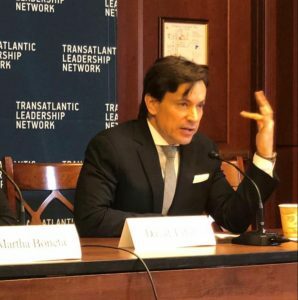 Michael Haltzel, Chairman of the Board, Transatlantic Leadership Network, delivering opening remarks. 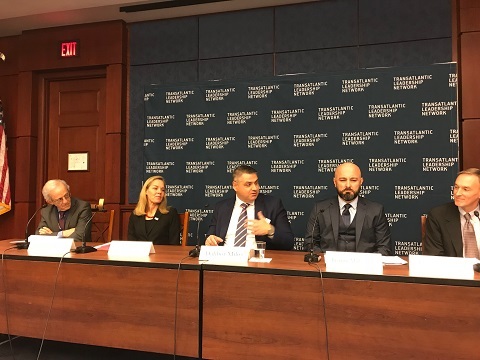 Chairman of the Board of the Transatlantic Leadership Network (TLN) Michael Haltzel welcomed attendees and announced the launch of the Transatlantic Leadership Network at its inaugural conference, “The Impact of Elections in MENA and the Western Balkans” on November 13 at the U.S. Capitol. Dr. Haltzel’s full remarks can be read here. “It is our belief that practitioners of international relations must reorient themselves to the dynamics of a rapidly changing world. Issues nearly unknown only a few decades ago must now assume central importance in national policy. 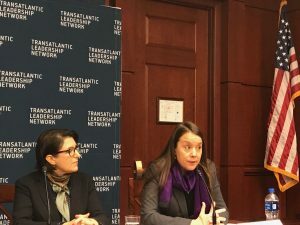 My colleagues and I at TLN recognize that there are many challenges to healthy and productive relations between the United States and Europe and the MENA region. 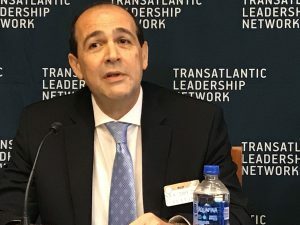 We hope and anticipate that the Transatlantic Leadership Network will be able to play a meaningful and positive role in shaping and reorienting American foreign policy to be more amenable to these changing dynamics,” said Michael Haltzel during his opening remarks. Amanda Bennett, Director of Voice of America, the largest U.S. international broadcaster, delivered opening remarks. 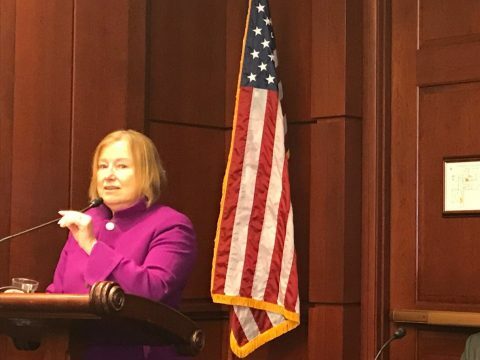 Bennett spoke on the importance of freedom of the press, and VOA’s role in supporting fair and independent media across the world. 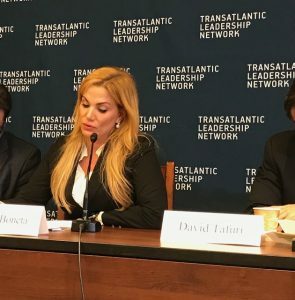 She congratulated the formation of the Transatlantic Leadership Network, stating that the organization comes at a necessary moment. 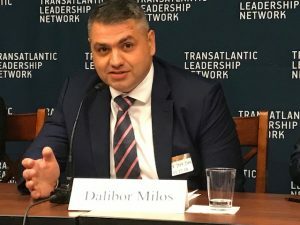 What’s Next for Bosnia and Herzegovina? Daniel Serwer, a professor at Johns Hopkins University SAIS and senior fellow at the Transatlantic Leadership Network, moderated the first panel, titled “What’s Next for Bosnia and Herzegovina: Is the Reform Agenda Still Alive?” Panelists included Jasmin Mahmuzić, Director of the Banking Agency of the Federation of BiH, Dalibor Miloš, Chairman of the Supervisory Board of Aluminij, Eric Carlson, Senior Advisor for BiH at the U.S. State Department, and Gretchen Birkle, Deputy Assistant Administrator for Europe and Eurasia at USAID. Gretchen Birkle emphasized the importance of economic development in BiH, and the role of USAID. She said, “USAID supports small and medium enterprises in BIH, and the adoption of legal frameworks in accordance with the European Union. 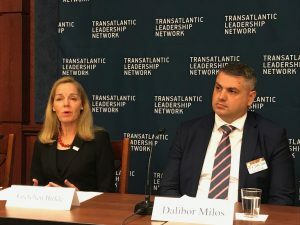 USAID will support the development of the private sector in BiH, and foster competitiveness in the energy sector, where BiH has great potential for export, especially in electricity.” Birkle also expressed hope that the news authorities will craft a plan that addresses education and economic development in the first 100 days. Read more here. Eric Carlson said that a strong and transparent democracy depends on the transparency of elections. He expressed concern about the alleged irregularities during the recent elections in BiH. 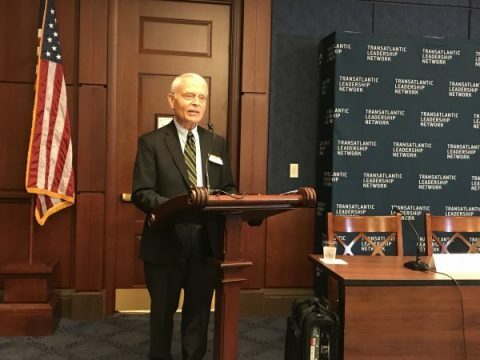 “The formation of power is a prerequisite for resolving the burning issues, including the issue of electoral law,” Carlson stated. In addition to changing the framework of elections, Carlson called for the representatives elected on October 7 to form a government in a timely manner; he also asserted that the next government should prioritize efforts in the rule of law and anti-corruption, jobs and growth, and improved public services. 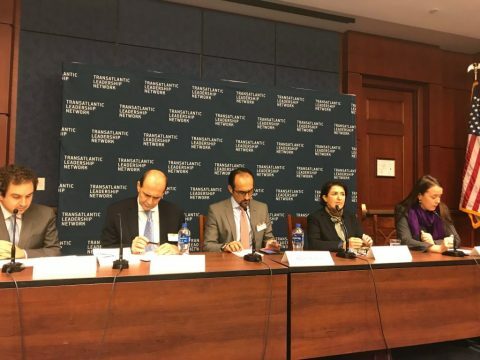 The second panel, “Prospect for Progress in Iraq and Iraqi Kurdistan: New Governments for Baghdad and Erbil,” focused on topics such as corruption, the role of PMUs and the Hashd al Shaabi, the question of the city of Kirkuk, and reflections on the October 2017 referendum. 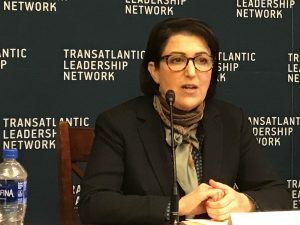 Panelists included Mohamad Jawad Al Quraishy, Deputy Chief of Mission, Embassy of the Republic of Iraq; Bayan Sami Abdul Rahman, Kurdistan Regional Government Representative to the United States; Bilal Wahab, Nathan and Esther K. Wagner Fellow, Washington Institute for Near East Policy; Daniel Benaim, Senior Fellow, Center for American Progress; and Amy Austin Holmes, Fellow, Middle East Program, Wilson Center, and Visiting Scholar, Weatherhead Center, Harvard University. “There is some optimism in Iraq these days and we should encourage it. The key for the governments in Baghdad and Erbil is to seriously tackle issue of corruption. The world knows of billions of dollars that disappeared during Al-Maliki government and beyond. Putting end to widespread corruption is a precondition to mobilize investment and rebuild the country. These messages were loudly heard at the Kuwait donor conference earlier this year where Iraq received only fraction (one-third) of financial commitment needed to rebuild various areas. I am also encouraged by the appointment of several experts in the government in Baghdad. It is a good sign things may start to change for the better. I also view growing relevance of Muqtada Al-Sadr as a positive sign for the people of Iraq. 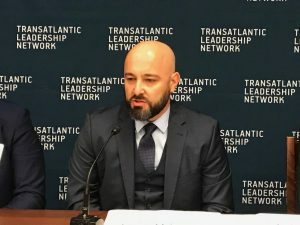 Continuously, he has been a supporter of transparent and expert government and this is what Iraq indeed needs” said Sasha Toperich, Senior Executive Vice President at the Transatlantic Leadership Network (TLN), who moderated afternoon panels. 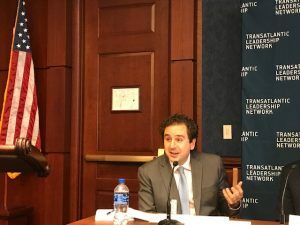 Speaking on the climate in wake of the Iraqi Kurdistan elections, Daniel Benaim commented, “This was a cataclysmic and difficult time. I had sensed a palpable sense of relief. This was a different year, a different moment, a different time, a different chance to do something better. The question is what you make of that moment. In the first instance in the wake of these elections, I saw a political consolidation boil down to these two power bases. Kurdish people found themselves more entrenched in the wake of this election than they were before it. ‘As one Kurdish scholar said to me, when you see the Hasdh al Shaabi in Kirkuk, you cling to your Kurdism.’” Benaim further commented that, though a politically unpopular thing to do, there is a need to shrink the Kurdish public sector. 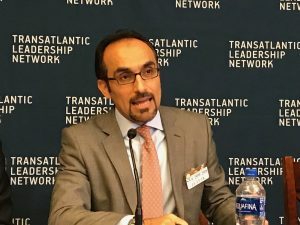 He further noted that the KDP and PUK show signs of cooperation in the Prime Minister and Deputy Prime Minister’s offices, which may be a place for the United States to lean in in defining this new moment in provide both moral, technical and financial support as well. 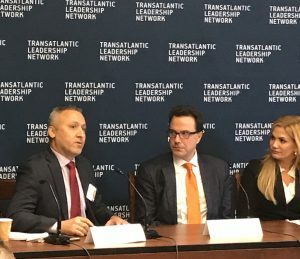 The final panel, “Investment as a Means to Strengthen Democracy and Stability in Fragile Countries,” was moderated by Sasha Toperich and featured David Tafuri, President of the U.S. – Kurdistan Business Council, Martha Boneta, Senior Adviser to America First Policies, and Delovan Barwari, Country Representative of the Barzani Charity Foundation. See the full panel recorded by Kurdistan 24 here.